Thurs. 19th Apr. : Marrowbone Bookstore, Dublin, 7.00 p.m.; Sin E (downstairs), Ormond Quay, Dublin, 9.30 p.m. Sat. 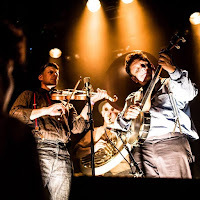 21st: Shoot the Crows, Sligo town, 6.00 p.m.; The Strand Bar, Strandhill, Co. Sligo, 10.00 p.m. They will then continue to play thirteen shows in Britain. NB: The BIB editor apologises for the fact that this post was first published with the erroneous time of 8.00 p.m. shown for the Sin E performance.